Address: Fatehabad Road, Taj Ganj, Agra, Uttar Pradesh, 282 001. Access: 10 kms. from Airport, 5 kms. from Railway Station, 4 kms. from Bus Stand . Facilities: Double A/C 95, Double Total 95, Suites A/C 5, Suites Total 5, Total A/C Rooms 100, Total Rooms 100, Centrally Airconditioned, 2, 225, 90, 2, 1, Business Centre, Banquet Facilities, Conference Facilities, Beauty Parlour, Shopping Arcade . Services: Doctor on call, Laundry, Money Changer, Banking, Safe Deposit, Baby Sitting, Valet . Situated within a kilometer of the Taj Mahal, The Taj View Hotel is also conveniently located just 10 kms from the airport. Guests can look forward to gracious interiors, personalized service, and the Taj’s inimitable style for a memorable stay.Stylish and comfortable, all guestrooms at Taj View Hotel evoke the beauty of the Taj Mahal itself, as well as offering uninterrupted view of it. All of the well appointed rooms open onto meticulously landscaped gardens and the pool. Light, airy, and modern, these rooms are well equipped with guest amenities including international direct dial facility, Broadband hi-speed Internet access, channel music, mini-bar, hair dryer, and tea/coffee maker. The exquisite suites feature a living room and bed room with two bathrooms. Include all of the above guest amenities as well as plasma TV. Guests can dine at the onsite restaurant that explores the nuance of the finest Indian and international cuisine, serving traditional and contemporary favourites. After a tiring day, unwind at the cosy bar with a glass of fine drink. 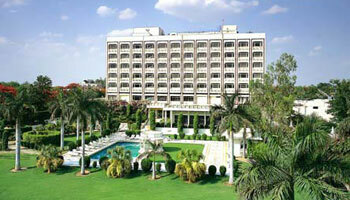 What do you think about Taj View Agra? The best thing about this hotel was the view of the taj mahal from our room. otherwise, room was dated, restaurant food very poor. staff really lacked energy. only there one night, thanksfully. Denver CO,May 6 2008: "Enjoyed the Taj View"
We spent one night at the Taj View in Agra, and we were pleasantly surprised with the hotel. After reading other reviews here on Trip Advisor, our expecations were pretty low. The hotel had a nice, clean room and indeed, a view of the Taj Mahal. You could definitely see the Taj Mahal from our 3rd floor room. We ate in two of the restaurants where the food was good, albeit slow to arrive. We also used the fitness center which was clean and filled with the typical equipment assortment. The pool looked beautiful, but we didn't have time to swim. This hotel is not as nice as some of the other Taj hotels we stayed in, but it was along the lines of other Taj properties. Traveler Washington DC, April 14 2008: "Nice hotel, good location"
The view of the Taj is not very impressive, but still it is a view of the Taj! The food is good at this hotel and service is excellent. Rooms were nice, clean and spacious. Would stay again. Psychogene Brussels April 2008: "View on what?" I booked the quite expensive Deluxe suite with view on the Taj. Well I get the chance to see the roof from the taj from far away between trees up to a wall (see picture of the view from the deluxe suite). The Taj can be apparently correctly seen only from the last floor and during the day only. Quality is quite poor compared to others Taj hotels I have visited. BK California March 2008: "Don't expect too much"
Having stayed at two other Taj hotels in India (Land's End and Exotica) we were expecting much more when we booked this hotel. It's old, the rooms need work, and the restaurant is just so so. Pool area is pretty. Check in person didn't seem to know what to do and kept asking questions when I presented her with my Taj Inner Circle card. Geneva Switzerland Nov 22, 2007 : "Nice hotel, great service"
I stayed here just for one night, but was very impressed by the friendly and helpful staff and comfortable room. I opted for a room with a view of the Taj, but due to the haze saw nothing. Unlucky for me, but not their fault. After a warm welcome at check in (including fresh juice and a towel to wash my hands), I was able to immediately book an indian head massage and foot/leg massage at their small spa for later in the evening (wonderful and reasonable). The room was clean and comfortable, with all the amenities. While perhaps not as fancy as the Taj Palace hotel in New Delhi (where I have spent a great deal of time), it is also a fraction of the cost; thus, a fair deal and good value for money. I found several details charming: a fortune teller in the lobby (a bit corny, but fun), live sitar music in the bar, and a traditional puppet show in the garden. I ordered room service for dinner, and was impressed with the timely delivery and friendly service (not to mention good food). I would certainly stay here again. Boston MA Aug 27, 2007 : "Oasis of comfort in Agra"
This was an oasis of luxury, cleanliness and comfort in the otherwise dirty, crazy city of Agra. As we entered the hotel for the first time, we were welcomed with fresh lime juice and garlands, and we knew that we were going to be taken care of. I recommend that you pay extra to get the top floor Taj-view room. This way, your experience of the monument is not limited to the actual visit(s). The staff was very helpful (whether running through the rain to get dry towels when we were in the pool, or getting a mechanic to our room to pry open our suitcase lock). The service at meals could have been better (they seemed understaffed and overwhelmed), although they seemed to be trying their best. Cirencester Mar 14, 2007 : "Very disappointed"
Compared to other Taj hotels, very very very disappointing. We have stopped in better Travel Lodges for less than half the price. Superior room small, paint splattered head board, bath half size which took 1/2 hour to fill. Buffet food OK. Service we received from desk unhelpful. Porters requested, but did not arrive, took my luggage myself, when I mentioned it to the manager he said we are busy Not good enough! Lobby uninspiring and dated. If you haven't got a Taj View room try elswhere. Did like the photo shop in the hotel though - excellent service downloading my camera memory stick.